5 Nutrition And Training Myths Of Bro Science Vs. Exercise Science, Part 3! It's important to follow only expert advice when you are dieting or building a nutrition plan to build muscle. Find out the top 5 myths of training and nutrition in Part 3 of Bro Science Vs. Exercise Science - get the truth and get results! Current research suggests that you can only absorb 15-20g of whey protein at a time. The reason for controlling the frequency of eating is to provide insulin control. Caloric expenditure from exercise is based on exercise intensity. This is Part 3 of the Exercise Science vs. Bro Science series. Just like in Part 1 and Part 2, the term "Bro Science" in this sense is false information and common misconceptions as it relates to bodybuilding. 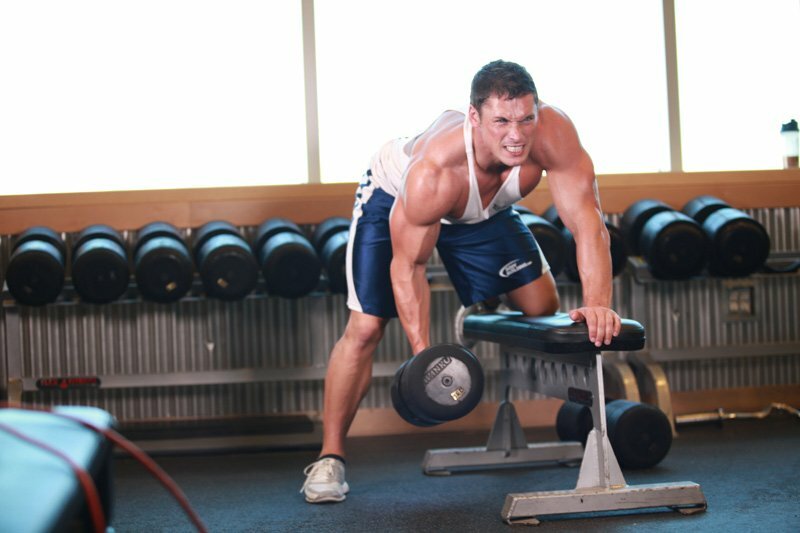 The focus is on gaining strength and building muscle as this is the focus of many lifters who train in the gym most days of the week. However, because of lack of time under tension and appropriate sets and rest periods; many lifters participate in what can be described as a modified strength program. In this article we&apos;re going to discuss the Bro Science and fallacies of nutrition in regards to dieting and actual muscle gain. You&apos;ve heard and seen it before in the gym, the common comments about diets and supplements that are taken as true. There&apos;s always one guy with muscles who assumes he knows what he&apos;s talking about when it comes to diet and training. So he has a few other "newbies" following him around in the gym following his workout and copycatting what he&apos;s doing. Here are 3 Bro Science fallacies that make up the bulk of gym talk in regards to diet. Whey Protein is actually the by product of cheese. The reason it has become popular as a protein powder for bodybuilders is because of its rapid digestion rates. When it comes to keeping your body in an anabolic state, this is ideal for stopping catabolism and introducing protein to your body post-workout for protein synthesis. Whey protein (the highest quality and best form of protein) is incredible stuff. It provides the body with the necessary building blocks to produce amino acids that are used for building muscle tissue. While it is true that insulin sensitivity, cell permeability, and absorption rates are increased following exercise, the big question is: if whey protein is digested so fast, how much does your body actually absorb? Common gym talk would lead you to believe that you can have 40+ grams of a whey protein shake at any time of the day. However the research does not support this. Current research suggests that outside of states where there may be room for increased protein absorption (post-workout), you can only absorb 15-20g of whey protein at a time1. This is not to knock whey protein; it is still the ideal protein for pre and post workout supplementation because of its speedy digestion time. But don&apos;t fall for the gimmick that you can take in 40-50+ grams in one sitting as some labels would leave you to believe. The key to whey protein supplementation is to stick to one serving at a time (most protein powders offer between 20-24g of protein per serving) for the sole purpose of preserving muscle mass (upon waking, pre and post workout). Otherwise, real food, casein, or a blended protein powder would be your best bet. One Serving At A Time. As someone who has been hands on training athletes and dealing with customers and supplements for years, probably the most common question I&apos;m asked in regards to muscle gain is: "I want to gain muscle and I want to get cut at the same time" or "I want to gain muscle but I want to stay as lean as I am right now". To accomplish this, many weightlifters will not change their diet at all and they will turn to supplements or simply workout more in an attempt to gain muscle. The truth is that without drugs or amazing genetics, this is a feat that is pretty impossible to reach. The only real instance, in which you can gain pure muscle without fat, or gain muscle while losing fat, is when you are untrained. Untrained means here that either you have never lifted weights or you haven&apos;t lifted weights in at least 6 months. The reason for this is that if you are at least a somewhat experienced weight lifter, you must be in caloric surplus, and keep your body in an anabolic state (a state in which your body has sufficient protein to prevent muscle wasting, this can be best achieved by consuming 5 to 6 small meals a day) from a diet standpoint to gain muscle mass. The Only Real Instance, In Which You Can Gain Pure Muscle Without Fat, Or Gain Muscle While Losing Fat, Is When You Are Untrained. As I discussed in an earlier article, there are ways to manipulate the macronutrient composition of your diet as to prevent from consuming an excess number of carbohydrates and gaining more fat then necessary. The excess of calories needed to gain weight depends on body type; but as little as 200-300 extra calories a day (including those lost through exercise) is needed to gain muscle. It should be noted that 2,500 calories of energy are needed for one pound of muscle, while 3,500 calories must be lost to lose a pound of fat2. On the other end of the spectrum, there are bro lifters who are big fans of the "bulking stage" in their approach to gaining muscle. This can be a result of miss-information or an excuse to be unhealthy while not in preparation for any events that would require dieting. The truth is that no matter what the body type, when trying to lean up and show off your hard earned muscles, you will lose less muscle and look much better if you can be as lean as possible before you start dieting. The supplements you take for gaining muscle will be most effective once you get things with your diet and training squared away. Consume the majority of their calories late in the day and before bed. Now with those things in mind, do you see any similarities between a sumo wrestler&apos;s diet and the average American? I hear it all the time from different people: "I don&apos;t have the time to eat breakfast". While you&apos;re asleep your metabolism slows because you are going 6-8 hours without food. It returns to normal upon eating breakfast. If you skip that meal you&apos;re in for a fat gaining day. How Often Do You Skip Breakfast? Another common practice is to skip meals, or eat light during the day, and then have a large dinner at night before bed. The problem with fewer meals has to do with insulin control. So often many people are told to consume more meals during the day to speed up their metabolism. But consuming breakfast and increasing muscle mass are the most effective ways (outside of supplementation) to speed up the metabolism. The reason for controlling the frequency of eating is to provide insulin control. Insulin is responsible for taking nutrients out of the blood and storing them. The longer you go without food, the more insulin will spike the next time you have a meal. And unless you&apos;ve just had a high intensity workout that has robbed your body of many nutrients, insulin will store as many of the calories that you&apos;ve just consumed as fat, as it is able. Fat is the storage form of calories in your body, and if your body goes long periods of time without food, it will respond by storing more fat to cope with your dietary habits. Unfortunately fat storage from insulin is optimized right before sleep because your body burns the fewest amount of calories while you&apos;re sleeping. For the ectomorph body types (those with smaller bone structures, with low muscle mass, they usually have a hard time gaining weight when they are in their teens/early twenties) but being lean is not so much of a challenge. Gaining muscle mass is. For these body types, showing muscle definition (chest, abs etc) can prove to be most difficult because of a lack of muscle. When I&apos;m approached by this body type, and I&apos;m asked questions on how they can get ripped, they usually begin to tell me about how they are cutting calories and hitting the treadmill in an attempt to get ripped. The problem is that they may not even have much weight that their bodies are willing to lose because they are fairly skinny by bodybuilding standards to begin with. My answer for this body type in regards to showing muscle definition is to focus on gaining muscle. Body fat may not be the issue, at 10% body fat I may appear to be leaner than an ectomorph who has 9% body fat, but it is only because of the muscle mass beneath my body fat that allows me to appear as if I have more definition. So if you are an ectomorph, and you want six pack abs and a defined chest and arms for spring break, do not focus on dieting and hitting the treadmill. Focus on hitting those weights. Do Not Focus On Dieting And Hitting The Treadmill. If you haven&apos;t heard it before, lifting weights is one of the essential keys to fat loss right behind diet and sleep in my opinion. The reason for this is because the more muscle mass you have the more calories your body burns at rest. Your 12-Week Daily Bulking Trainer - Wednesday, Week 9: The Importance Of Sleep And Recovery Time! Your 12-Week Daily Bulking Trainer - Wednesday, Week 9: The Importance Of Sleep And Recovery TimeCheck out today&apos;s training routine here!Get the full series listing here! It is often thought that the type of weightlifting that should be done for weight loss is one that employs a large number of repetitions. The thought behind this is that the increased reps lead to increased calories burned. The first problem with this is that the rep range accepted for gaining muscle mass is between 8-12 reps. The major problem is that the caloric expenditure from exercise is based on exercise intensity, and to debunk this fallacy even more, high intensity exercise leads to an increase in anabolic hormones like growth hormone and testosterone that lead to the metabolization of fat. For Weight Loss Is One That Employs A Large Number Of Repetitions. Hopefully some of these points clear things up for you when it comes to what is fact and what is fiction when it comes to the training and diet talk of your fellow gym rats. There is tons of misinformation out there that continues to circulate (as evidence by those who are in the gym who fail to improve from one year to the next). While it is true that not all of us have the genetics to be professional bodybuilders or professional athletes; the one thing we can all do regardless of body type is improve. Oben J, Kothari SC & Anderson; ML. An open label study to determine the effects of an oral proteolytic enzyme on whey protein concentrate metabolism in healthy males JISSN 2008 5(10).